Project Star gate is the collective name for advanced psychic functioning & Remote viewing experiments and programs that were undertaken for over twenty years to create a trainable, repeatable, operational and if at all possible, accurate method of psychic spying or information gathering for the U.S. Military and intelligence agencies (CIA, NSA, DIA). Below in this page we will present a very small smattering of the type of remote viewing documents that were produced during this intensive time period. The Issac Koi collection – 92,000+ documents – 3.5GB download file, index of al documents and much more. Note: Please be aware the links in this collection do not currently work – visit this page for a background and discussion on the Star Gate project – but us this link to download the Actual Star Gate documents. The start of Remote Viewing. Due to reports like this and the book Psychic Discoveries behind the Iron Curtain, SRI (Stanford Research institute) was contacted and contracted to test the waters and to see if there was anything viable to psychic functioning. From 1972 – to its disclosure in 1995 the American Intelligence and military machines used and expanded forms of ESP or psychic functioning for intelligence gathering purposes. This mainly settled on a form of PSI functioning known as remote viewing. The agencies involved in this twenty year and $20M program include a huge assortment of spaghetti soup name agencies like: FBI, CIA, DIA, assorted military and government departments and agencies, many leading science labs and probably many others with names that cant be mentioned and that are yet to be uncovered. In 1994/1995 when key players and the remote viewers started to leave their military/intelligence careers behind them ( and Russel Targ’s FOIA request). It was decided to take the entire program history public to ‘head-off’ the coming media interest. A decision was taken to publicly validate the Star gate program for its accuracy of data and efficiency – hence to sanitize and clean the entire Star Gate records for all those involved in-light of the looming media disclosure. After all no-one wants to be associated with large dollar spending on psychic programs that don’t work! – do they? With this the program went officially public in 1995 just after it had been turned over to the CIA. The CIA then through its FOIA system initially released 12,000 files totalling 89,000 pages of material form the entire twenty year history of the program. Within this site I have and continue to post the more interesting and useful STAR GATE documents released through the FOIA from the CIA. I have picked out papers, documents and when I can, sessions that can be used by the remote viewing community and people learning to be better viewers. This report summarizes results of the three-year GRILL FLAME project, which terminated at the close of FY 1983. -It contains key findings from the various project activities, and identifies potential follow-on efforts. o Remote viewing is a real phenomenon, and is not degraded by distance or shielding. o Remote viewing ability can be improved by appropriate training procedures. o Remote viewing has potential for US intelligence applicacations. However, at this stage of development, descriptive content (e.g., sketches, configurations) is more reliable than analytic content (e.g., function, complex technical data). o A potential threat to US national security exists from foreign achievements in psychoenergetics. In the USSR and in China, this research is well funded and receives high-level government backing. “…To determine whether progress in RV training carried over to operational tasking, the most advanced viewer at SRI was at various times’targeted on sites of operational significance throughout the program to find out if he could collect information of intelligence value. This viewer was given 15 operational targets. Using the accuracy rating scale defined in Table I, intelligence analysts assigned ratings of good to excellent to approximately 40 percent of–the RV responses. The effect of the RV training procedures can be seen in the data from this series. The accuracy rating average for the last five targets was 2.2 on the three-point scale;;the average from the first five (before training) was 1.4. “…Overall results between the SRI viewer and the INSCOM viewers were consistent (40 percent and 50 percent accuracy levels). These results clearly indicate that the RV phenomenon has intelligence application potential, especially where configurational aspects of RV data can be of value. However improvement in RV data reliability for both configurational and analytical content is still required before application of RV data to intelligence tasks can become routine. (U) For any field of knowledge to be considered a science, those involved in the field must adhere to some very rigorous guidelines. In the hierarchy of science, physics would be considered as the purest science; the other physical sciences would follow, then biology and medicine. Psychology and the other social sciences would follow these. Psychoenergetics has its place somewhere between psychology and the other social sciences. It has not been reduced to mathematics and there is no physical model, but psychoenergetics does have many characteristics that are common to all science. The first of these characteristics is replication. If an area of endeavour is to be considered a science, experiments must be replicable. When the results obtained in one laboratory cannot be obtained under the same experimental conditions in other laboratories, the work will be neglected and will be considered to fall outside the parameters of science. – Bell Laboratories, Columbus, OH. ~ Standard medical/physiological/psychological screening is not useful. ~ Spatial resolution is accurate down to millimetres. In AMSAA’s program, from 1978 to 1980, it.was proven that site descriptions are of higher quality than location-pinpointing or tracking information. The total of the proposed three-year program was to develop the remote viewing phenomenon to a point where it could be used to collect intelligence. This goal was achieved. A summary of application-oriented skills developed at the present time is given in Appendix B, along with possible applications for the future. ~ Lack of physical model does not preclude existence. ITAC: There were a few.spectacular reports … the project confirmed with uncanny accuracy the presence of a recently constructed major ditch array and the number and type of elite units in a remote garrison area. CIA: In summary of our experience with GF, thus far, tends to strengthen the validity of the techniques involved and also indicates that its greatest utility as an operational tool may be in the CI field. JCS: In 16 out of 18 cases GF sources described the facility in sufficient detail to allow positive identification. December 1984 – SPECIAL ACCESS PROGRAM FOR GRILL FLAME. As part of an overall training R&D Task, SRI International has investigated a number of potential training procedures. One of these, which is the focus of this particular study, involves multistage, coordinate remote viewing. In this procedure,* coordinates (latitude and longitude in degrees, minutes, and seconds) are utilized as the targeting method, which is structured to proceed through a series of well-defined stages in a particular order–hypothesized to correspond to stages of increased contact with the target site. (S/NF) In this study, the basic hypotheses of the procedure were investigated under strict double-blind testing conditions in order to document whether, and to what degree, the hypothesized training approach provided a viable vehicle for RV technology transfer. The DIA COTR in residence selected three individuals from the staff of the SRI Radio Physics Laboratory. He tested them for baseline RV performance levels over an initial series of five sessions each, and then turned them over to the SRI Psychoenergetics Program staff to be exposed to the theory and application of the procedure in question. A baseline region of relatively poor performance.An unstable region of anomalously-high “first-time effect” immediately following initial instruction. A region of slowly-increasing stable growth to levels above baseline performance. (2) the increase in mean performance level achieved in training (as compared with baseline). It thus appears that the data generated in this study, collected under rigorous double-blind conditions and analyzed by objective computer-automated procedures, provide support for the Track I Training model developed in earlier efforts. All remote viewers showed an increase in performance over baseline level, exhibiting growth in conformation with a predicted performance curve–one significantly so. [daz] A key document on the early development of CRV and the identification of noise and signal and how to decrease noise and enhance signal. This document also shows very early CRV resulst in operatioonal tasks, assessed by an intelligence source, and also included some early CRV session work by the creator of CRV,, Ingo Swann. “Since the introduction of coordinate remote viewing (CRV) several years ago, it has been apparent that CRV is often capable of yielding highly accurate and useful data. There are, however, several instances of failures, in which the CRV description did not correspond to ground truth reality. Since one of the program tasks is to “continue the investigations of methods to improve the phenomena,” a special study program was set up to attempt to determine the factors that affect CRV reliability, and, to the degree possible, to develop procedures to minimize the deleterious effects of such factors. * (l) Vertical Potential. Given that an individual exhibits a demonstrable CRV ability, is it possible to develop that ability beyond a neophyte status, that is, increase the signal-to-noise ratio? * (2) Horizontal Potential. Does the CRV process possess a structure sufficiently definable to imply a meaningful construct for transfer/trainability across a broad base of individuals, potentially providing increased reliability on the basis of cross correlation of multiple CRV responses? 1984 Ingo Swann evaluation of Paul H Smith & Ed Dames training in New York. 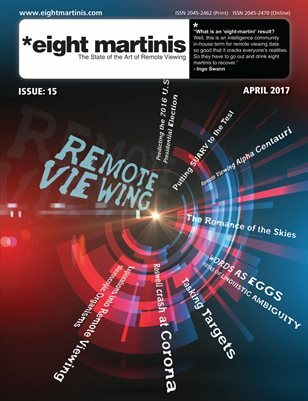 “Evidence continues to accumulate, in our laboratory and elsewhere, that remote viewing is a real phenomenon, and is not degraded by distance or shielding.Evidence gathered to date permits the tentative conclusion that remote viewing abilities can be developed by appropriate training procedures.Analysis by intelligence specialists indicates that remote viewing has potential for U.S. intelligence applications.At this stage of development, descriptive content (e.g., sketches, configurations) appears to be more reliable than analytic content (e.g., function, complex technical data), but steady progress is being made on the latter”. The 1973 Psychic probe of planet Jupiter – Harold Sherman & Ingo swann.